Four long years of bloody conflict came to an end in 1918, but not before the First World War had claimed the lives of millions of soldiers and civilians. “In 1918, a series of major German and Allied offensives broke the stalemate of trench warfare on the Western Front, resulting in the near-collapse of the German Army and the end of the fighting before the year was out,” says Auckland Museum Chief Executive Dr. David Gaimster. “New Zealand units played their part in the Allies’ final push for victory, helping to breach the main German defence system – the Hindenburg Line – and capturing the walled town of Le Quesnoy, France, during the final weeks of the war,” he says. From uplifting music to poetry and spoken word, the programme will allow visitors to find emotional touch points as they explore our commemorative spaces. The Museum will be open immediately after the Dawn Service on The Court of Honour, with free entry to the Museum for everyone. “Museums are civic spaces where people reflect in peace: the First World War claimed 18,000 New Zealand lives and wounded 41,000 more. At Gallipoli alone, 44,000 Allied soldiers fell, including 2,779 Kiwis, and, alongside them, 87,000 Ottoman defenders. We commemorate all who fell and those who bore the memories," says Dr. Gaimster. Hear from Saint Kentigern College's premier choir Kentoris, take a free tour of our WWI & WWII galleries with our highly-trained guides, hear from the Auckland Youth Choir and the ACG Parnell College chamber orchestra and choir. For families, there will be poppy-badge making activities and you can hear from the finalists of our popular annual ‘Lest We Forget’ poetry competition. Our friendly staff members will be on-hand in our war memorial galleries to help you research family members through Online Cenotaph, the digital memorial of those who served for New Zealand. Our mobile roadshow unit He Pou Aroha will be outside where you can bring in letters and medals and have them uploaded to Online Cenotaph, to provide a lasting legacy for generations to come. Following our inaugural video live-stream in 2017 that attracted tens of thousands of viewers from around the world, we will again be broadcasting live from inside the Museum to our Facebook page with an expanded programme of performances and Museum content. 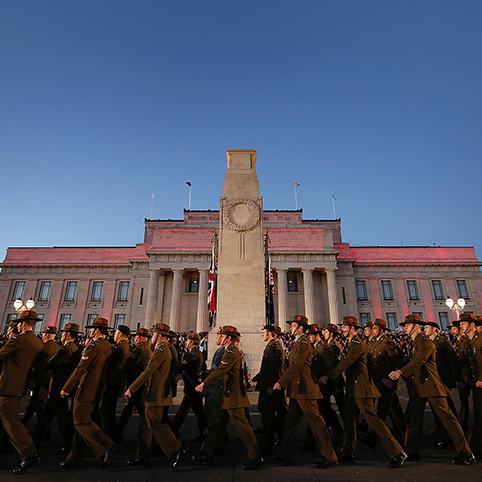 For information on getting to the Anzac Day Dawn Service, please visit Auckland Council’s website.